It is a privilege to see the results of the work our supporters make possible. As a refugee myself, I know what a difference a caring individual or a warm coat can make to someone new to the U.S. I also know the extraordinary relationships that form when people like you welcome refugees into their lives. Thank you for being part of a welcoming community. 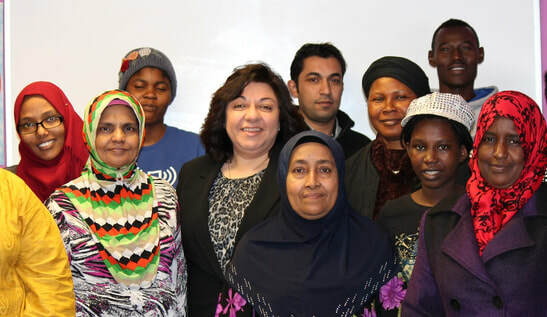 Make a donation to help refugees already living in Chicago build new lives of opportunity and self-reliance. Support our efforts to educate our communities and local leaders and advocate on behalf of all refugees. Advocate for refugees who are still hoping to find safety here in the United States. Call your representatives to express your opposition to this Executive Order and voice your support for refugees and the resettlement process. Find your elected leaders' contact information here. Volunteer to help newly-arrived refugees as they adjust to life in Chicago. Tutor refugee children in their home. Requires a commitment of two hours weekly for six months. Sign up for our newsletter. You'll only hear from us once a month, or when it's really important! Follow us on Facebook and Twitter to be the first to know about ways you can help.